If there was a theme to this year’s 2015 Consumer Electronics Show, it was 4K Resolution TVs and Displays. NEC’s introduction last winter of its first 4K display, the EA244UHD 24" 4K Widescreen Desktop Monitor w/ IPS Panel opened up an entire new world of resolution for desktop image editors. Don't need that level of resolution, but want a superb wide-gamut desktop display, the PA302W-BK 30" Color Accurate Desktop Monitor is one solution. We were interested in how this technology might impact our imaging and editing workflow. A 30-inch display is a serious piece of hardware to consider and once you start working with one it’s mighty tough to return to a smaller display. 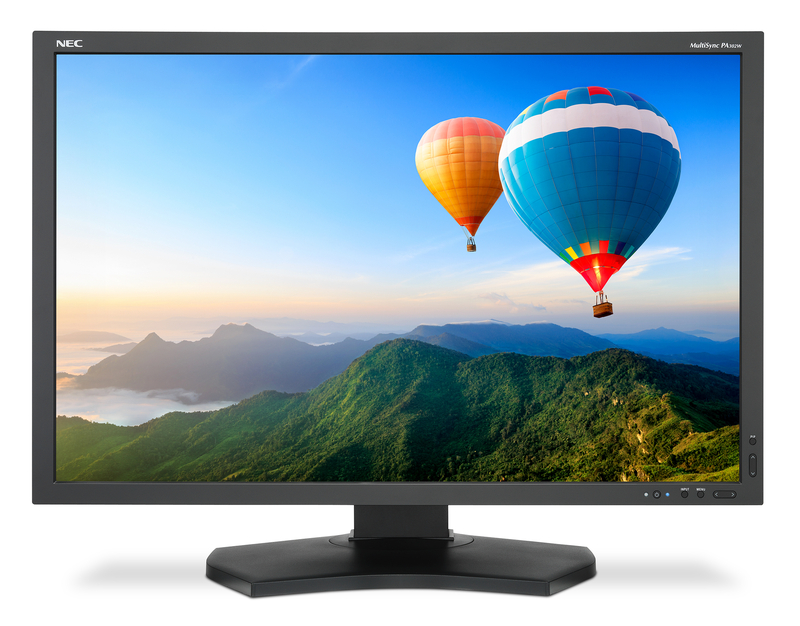 In the past, smaller displays often held the quality edge, more consistent lighting, tighter calibration, but that was then, and the NEC PA302W-BK 30" Color Accurate Desktop Monitor is now. We have previously reviewed its predecessor, the PA271W that covered 97.1% of Adobe RGB, and 100% of sRGB, and used CCFL for its backlight source. By comparison the new PA302W sports an LED backlight, and can cover 99.3% of Adobe RGB, and naturally 100% of sRGB. So, in terms of gamut, the new model is a serious step up. Both units are SpectraView compatible displays, and using the optional NEC supplied SpectraViewII software and the NEC-customized calibration sensor, calibration was easy, fast, and efficient. Our review sample also included the Professional LCD monitor hood, which we have come to view as an important accessory for serious editing. The PA302W proved extraordinarily stable. Befitting a professional display, it shipped with an individual proof of calibration printout, created at the factory. Once we calibrated using the Photo Editing Target, which is 6500k @ 2.2 Gamma, but with the luminosity set to 110 cd/m2, a setting a bit lower than the default. According to NEC “the GB-r LED backlight consumes 44% less power than a comparable CCFL backlight”. It can be controlled via two different software packages, NaViSet Administrator, and MultiProfiler™ software that provide complete control over the five picture modes, including the loading of any ICC profile directly into the monitor for optimal color space matching. This might not sound like you would use it, but you would be wrong! The sRGB color space is pretty limited and used mostly for the web and some Print On Demand services such as Blurb, but most professional image editors would most likely prefer to work in a larger color space such as Pro-Photo RGB or Adobe 1998 RGB. Using MultiProfiler, a user can quickly switch the color space of the display to accurately display how an image might appear in another color space. While Photoshop for example offers soft proofing, it’s emulation via a profile, not the same as hardware calibrated display held to tight standards. So, the ability to accurately change color spaces on the fly is a potent tool for the serious editor. While Apple might control the image and video editing world, the truth is that the Mac OS is at a serious disadvantage compared to the Windows world. Why? Because Windows supports 10-bits in the graphics display chain, it supports the PA302WW, with its 14-bit 3D internal programmable lookup tables (LUTs) for calibration. Got Mac? Too bad, until Apple updates its graphics support for 10 bit graphics, you can’t take advantage of those extra bits, which are clearly visible in use with smoother transitions, and less banding. Are you listening Tim Cook? One spec you need to check first, is the resolution that your video card will support, as the native resolution is 2560 x 1600. It is also stunningly bright should you need that sun like level of luminosity, 340cd/m2, but as we mentioned earlier, for photo editing you would throttle that back to around 100 cd/m2. Using it was a natural step up from the 27-inch model, similar menu options, and similar look and feel, with a professional build-quality. The unit carries a 4-year warranty, and we recommend it without reservation. We were excited to unpack and setup the EA244UHD 24" 4K Widescreen Desktop Monitor w/ IPS Panel. After last year’s trickle of 4K televisions opened to a small deluge, and Apple started shipping a 5K iMac, it was natural to expect 4K displays to follow. I teach courses at UArts that utilize the old, tested, and true analog color process of Type-C print material and honest-to-God film. While most color processors have died and gone to heaven, it’s a shame since the key difference between working with color film and paper, and their digital equivalents is that for all of digital color’s strengths, its drawback is that everything is finite. Ink or no ink. Pixel or no pixel. There is simply no room for a gray area, or continuous tone. So, ink is laid down over other ink, drops vary in size a bit, but for the most part, digital input and output is ultimately about numbers, precise, unvarying numbers. Compared to analog film and paper, which is continuous tone through and through, along with accompanying errors, lack of linearity, and bias. But hey, what you rather have, auto-tuned Robin Thicke, or the imperfections and humanity of the Stones, Beatles, and the Clash? And it turns out that students taught in a color darkroom seem to have a more refined sense of color than those who are purely digitally trained. How does this apply to the world of high-resolution displays? It's simple really, since as you reduce pixel size on a display, and increase the color gamut and bit-depth, you begin to emulate analog photographic processes. Just as an Apple Retina iPad produced an image with smoother tones, less banding, and a more fluid like display owing to its higher resolution, so goes it with large desktop displays. In some ways we were hindered in our ability to review the EA244UHD 24" 4K Widescreen display because despite having a NVidia Quadro 4000 graphics card in our older tower factor MacPro, its design spec couldn’t match the native 3840 x 2160 resolution of the EA244UHD. Despite this minor setback, we used it for several months, and despite not being able to display at its native resolution, the greater pixel density created a gorgeous image, which can best be described as almost liquid in appearance. This is a different class of display than the PA302W, as the EA244 UHD is centered on consumers as opposed to their professional SpectraView product line. Like the PA302W, it can display 99.3% of the Adobe RGB color space, and the entire sRGB color space. NEC modernized the menu controls on the EA244UHD which are touch sensitive, instead of the little buttons of the SpectraView line, and it is plenty bright at 350cd/m2, about the same as the PA302W. The comparisons between the two displays are appropriate as they reveal a consistency to the NEC product line and design goals. It has an ambient light sensor that will adapt the display’s calibration to different ambient light levels, but we found life better without it activated at least for serious color work. We did like the Human Sensor that detected movement in front of the display to help save energy, a laudable goal. Confused by the differences between the units? It’s reasonable given the level of technology packed into the units. To summarize, the main differences between this EA244UHD and the PA302W (aside from resolution) are that EA244UHD cannot be calibrated to a gamut other that its native gamut, which is 99.3% Adobe RGB, while the PA302W can be calibrated to any gamut. The EA244UHD only has one level of uniformity (ON or OFF), while the PA302W has 5 levels plus off. NEC describes it as “Digital Uniformity Compensation, which reduces screen uniformity errors and compensates for differences in color/grayscale and luminance using new signal processing circuitry.” What this means in practice is that the display is calibrated at the factory, and that data is stored in the display. When you engage Digital Uniformity Compensation it is based on the lowest performing pixel, and adjusts all the other pixels to that value. This is not unlike a scanner that first does a warm-up scan to determine if any sensor photo sites are reading different than ideal, it then adjusts and brings all the values into a null calibrated equal, and voila, no streaks in the scans due to sensor shifts. Digital Uniformity Compensation works much the same way, using the stored calibration data to insure that no pixels are brighter than another. We accessed it via the free NEC MultiProfiler app that allows the user to easily access all the controls and features of the display. Does Digital Uniformity Compensation matter to you? Depends. On a new display, probably not so much, but as a display ages it assures you of linearity, a very welcome feature. Color is also adjusted, the reddish or greenish hues that are typical on other monitors are corrected by Digital Uniformity Correction. The PA302W has a backlight sensor. EA244UHD does not. This is a feature we have been waiting for, as it not only predicts color shift, on the PA302W it can compensate in real time as the backlight shifts due to changes in temperature or humidity. In the past we tried other schemes to do this, normally using a calibration puck with an integrated white diffuser, but these were designed for ambient light, not the actual backlight. This feature should insure that the color you see in the morning is the same as late at night after a full day of use. The PA302W has 5 completely customizable picture modes. EA244UHD has several factory-calibrated presets but they are not extensively customizable. The EA244UHD carries a 3-year warranty, while the PA302W carries a 4-year warranty. And finally, there are no hood options for EA244UHD. Either of these displays opens up an entirely new world of image editing for professional users. The image is stable, consistent, highly calibrated with minimal shift even after months between calibration cycles. NEC has built an enviable reputation for its professional and consumer displays, and these units are no exception. Both the EA244UHD and the PA302W come highly recommended.